From best-selling developer Eipix comes the exciting continuation of a classic Phantasmat brand! 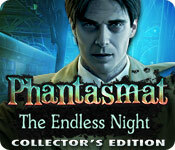 Phantasmat: The Endless Night Collector's Edition is rated 4.0 out of 5 by 76. Rated 5 out of 5 by AlisterDalimar from A Series Returns! Phantasmat is back on track! The Endless Night is a highly enjoyable thriller mixed with time travel and some rather tragic elements of grief. Great premise, great gameplay. The whole - find your daughter and survive - premise reminds me of a new release a few weeks ago... Phantasmat 12! This game is a great buy. If you're looking for a game to fill up a sale, get this one. It'll be worth it. Rated 5 out of 5 by Kimmycoo from Fantastic Game I love all of the games in the Phantasmat series. They are crisp, precise, beautiful. I love the mini games and HOS. I loved the Collectors Edition for all of the Bonus content. The ending of this game surprised me and actually made me gasp. I dont think Ive ever had an HOG do that to me. I was so surprised at the end. The only thing I would like to see is the use of more real actors. It really brings a lot to a game, this one did not have that. However it had a lot of characters for you to help along the way and I like that. HOS games get lonely and I like having a character in the scene with me as I play. I highly recommend this awesome and amazing game. Great job artists! Rated 5 out of 5 by aussiepenguin from Great game I've had this game for a while, but hadn't played it yet, and I'm glad I finally did! I really enjoyed it. I loved the different styles of HOPs - it helped to keep the game interesting in that they weren't your usual 'lists' or 'FROGs'. I found the mini games and puzzles to be interesting without being impossible. I've enjoyed the other Phantasmat games before this one, but this was the best by far. Looking forward to the rest of the games in the series! Rated 5 out of 5 by tutortime from Excellent, Excellent, Excellent Game. Can't say enough positive things about this game. Interesting story line, great graphics, many different scenes to interact in, best mini games I have seen, and bonus find item in each scene. The CC was well worth the extra money as it was all new scenes and there were quite a few for a bonus chapter. Rated 5 out of 5 by augrad18 from Not endless but very fun game! Great game! Had all the components I look for....morphing objects, collectibles, usable map, not too hard but well hidden objects and challenging but not frustrating mini games. Story was entertaining and easy to follow with a surprising ending...for me at least! Developer has a sense of humor so be sure to read the credits. Rated 5 out of 5 by mharrigan from Creepy Carnival Theme Loved this game, especially the Creepy Carnival Theme in some of the later levels. 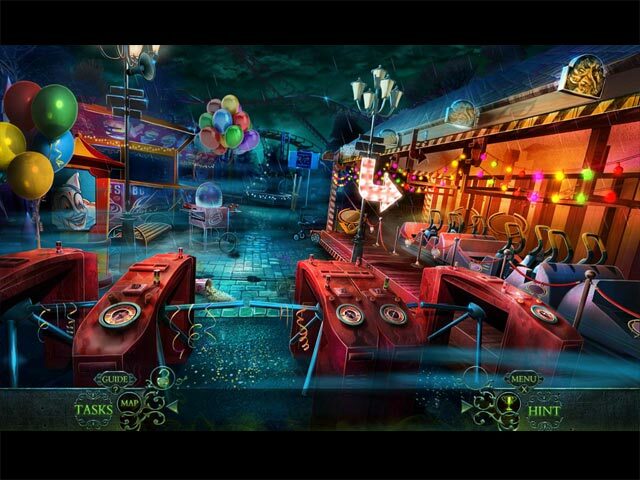 Creepy Clowns, games and amusement rides...this is just such a fun theme...great game. Rated 5 out of 5 by IPickYellow from My Kind of Game My kind of game because I love adventure and puzzles over HOPs. However the HOPs in this CE are interactive so they were fun as well. The puzzles are challenging, inventive, but not overwhelming. They are logical to solve, and not daunting. Too many games are riddled with illogical puzzles that get frustrating. But here they kept me actively involved and curious. There was a lot of content to this game as well, and a nice bonus that followed along with the storyline and didn't shirk on content. Love Eipix! They deliver great games. Rated 5 out of 5 by Penhip from WHO YOU GONNA CALL?.... WHY EIPEX OF COURSE!! if you have not played the first Phantsmat, you are missing out on what may be the best game of the series, although Endless Night comes closest to capturing the original spirit (cough) of this series. Combining creative innovation and technical savy, EIPEX utilizes their resources to great effect in Endless Night. What struck me almost immediately were the stylistic choices such as the vivid colors of EN which amplified the surreal elements of the storyline. The surprise ending was also a very effective element of the storyline and series at large. I would have loved the bonus chapter to explore this further but alas it took us in a whole other direction. Endless Night offers an array of mini-games, plus objects (which become yet another vehicle of play and creativity) and fantastic HOS's that combine old with new to create a great alchemy of fore and gameplay. Thank you EIPEX! and Congratulations on a sequel well done!!! Rated 5 out of 5 by kdeltakilo from Another brilliant game from Eipix! An auto accident on the way to the prom ends in an accident that happened 50 years ago. Now your daughter has been kidnapped by the past, and you have to save her. But everything is not as it seems. 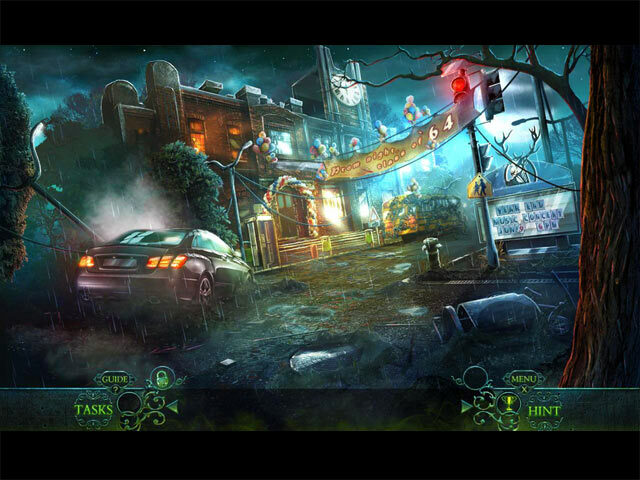 This is a great storyline with a mystery that unravels as you play the game. After the accident, mother and daughter are separated, and you, playing as the mother, not only need to find your daughter but help the victims of a tragic factory accident. The victims are ghosts with haunting memories and they need closure. You give it to them, and it’s a pretty satisfying feeling because these ghosts are all sympathetic and believable. The game play takes place in some cool locations: a high school on prom night; an amusement park (my favorite location since I’m a sucker for carnivals); a mall, and the ill-fated factory. It has great artwork, is fun to explore, and it completely sucked me in. I was mesmerized by this atmospheric game and couldn’t stop playing. Totally fun. This has just the right creepiness level, and is not too dark or demonic—even though it has ghosts. You collect eyes as you play, so keep an eye out for those. They are in every location, but some are hard to spot. The HOS were well thought out and clever. In some HOS you have to find morphing objects to unlock the list of hidden objects. 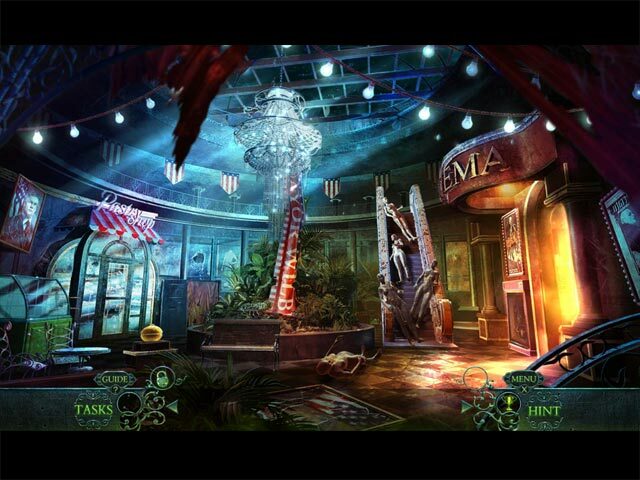 In others you use items you collect to unlock the list of hidden objects. In addition to lists, there are silhouette scenes. Some of those were hard to make out, and that is my only complaint about this game. If you don’t want to do the HOS, you can play match three. There were just the right amounts of HOS for me. I loved the mini-games, especially in the amusement park. It has some classic arcade games, such as wack-a-mole, iron man, pinball, and duck shoot. On the duck shoot you have to pair up the animals by symbols—not by kind—so pay attention to the symbols on each animal. The animals are on three wheels, and each wheel can be rotated. The animals don’t have to be in the center—or in the triangle created by the three wheels. They just have to be visible for you to take your shot. As you shoot the pairs, they drop off the wheels. I found the mini-games in the bonus chapter to be a little more challenging than in the main game. I think I skipped one mini-game in the main game, but I skipped at least two in the bonus game, and it’s far shorter. The bonus game was just as much fun as the main game and carries on the story, but from a different characters point of view. I even liked the locations more in the bonus game, and that’s saying a lot because I loved the locations in the main game. (Well, except the bonus game doesn’t have an amusement park, but it does have a train station, and trains are another favorite location of mine.) I highly recommend the CE because the bonus game is so much fun. My only complaint about the bonus game was that it was too short and ended rather abruptly. I enjoyed every second of this game and hated for it to end. Be sure to read the credits at the end of the main game. They are hilarious! Eipix just gets better and better. I think I’ve bought all of their games now. They are certainly one of my favorite game developers. Hats off to all the brilliant folks at Eipix! Well done!